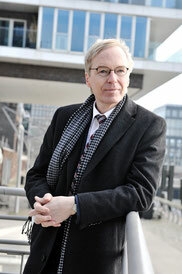 Hans Janus was born in Essen in 1954 and studied Law and Russian at the universities of Bochum and Hamburg. During his judicial service traineeship in Hamburg and Cologne, he worked for the Committee on Eastern European Economic Relations for a while. After passing his 2nd state law examination, Hans Janus spent the academic year 1981 - 1982 as an exchange researcher with the support of the German Academic Exchange Service (DAAD) at the legal faculty of the Moscow Lomonossov State University. Hans Janus was awarded a doctorate for his thesis with the topic “Tax law and international tax law of the Soviet Union”. For over 30 years Hans Janus was a decision-maker responsible for the government export credit guaranties of the Federal Republic of Germany (the Hermes cover) acting as a sole responsible member of the Management Board from 1994 to 2014. He represented Euler Hermes and the Federal Republic of Germany for over three decades at international negotiations, conferences and meetings in more than 50 countries. Hans Janus also performed various functions within the Berne Union, the global association of credit and investment insurers for more than 20 years. He was part of the Management Committee of this association from 1992 to 2014, led numerous international financing workshops and was President of the association from 2003 to 2005. Hans Janus possesses broad knowledge in the area of managing large companies, but as chairman of supervisory boards of family-owned, mid-sized companies, he also has expert knowledge about the specific workings of small and mid-sized companies. The regions of Eastern Europe and Central Asia have always been Hans Janus’s area of special interest. Already as a student, he took an interest in the economic and political issues of the former Soviet Union, where he also did research at the Moscow Lomonossow State University in 1981 - 1982. . The USSR, later Russia and other states of the CIS have always been among the most significant target countries for state export guarantees and were at the focal point of Hans Janus’s professional activities. He has frequently travelled through Russia, Kazakhstan, Uzbekistan, Kyrgyzstan, Belarus and the Ukraine and has cultivated numerous contacts in those countries. Through his cooperation with a large number of associations and organisations, he is well acquainted with everyone who is interested and is of interest in these regions.